The eco-friendly solid and dry granules impregnated with flavoring substances are placed, as a rule, in various types of decorative bags. 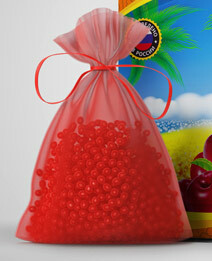 Sachet contains granules which encapsulate the fragrance that does not evaporate but absorbs a large amount of odor. It includes hanging strap to be hung anywhere convenient in your car.